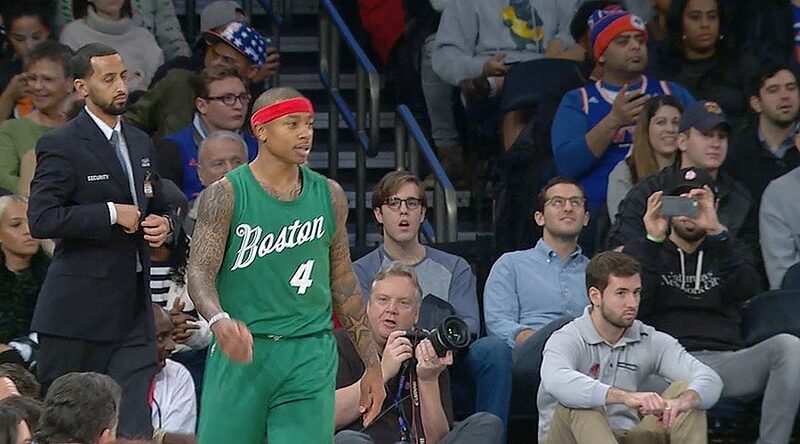 NEW YORK, Sporting Alert – Isaiah Thomas scored 27 points and led six players in double-digit scoring and the Boston Celtics beat the New York Knicks 119-114 at Madison Square Garden on Christmas Day. Jae Crowder added 16 points and six rebounds, Kelly Olynyk finished with 16 points, while Al Horford ended with seven rebounds, five assists, three steals and two blocks for the Celtics, which shot 48.4 percent. Marcus Smart went 5 of 9 from the floor for 15 points to go along with seven assists and Avery Bradley chipped in with 11 points for Boston (18-13), which led the entire second half. Carmelo Anthony scored 22 of his 29 points in the second half to lead New York, but missed out at scoring 30 or more points for the fifth time on Christmas Day after struggling in the first half and fourth quarter. Anthony also pulled down seven rebounds. The star forward notched 30 plus points in his four previous Christmas Day fixtures – doing so in 2009 at Portland, 2011 at home against Boston, 2012 at Los Angeles Lakers and in 2014 at home against the Washington Wizards. Derrick Rose had 25 for the Knicks, Kristaps Porzingis adding 22 points, 12 rebounds and four blocks and Joakim Noah grabbed 12 rebounds in the defeat. The Celtics led in the entire second half. It was the second time this season Boston was beating New York, following the 115-87 win on Nov 11. Jae Crowder, Al Horford and Isaiah Thomas all scored 11 points in the first half, with Crowder hitting three 3-pointers to give Celtics a 42-37 lead with 4:38 left in the second quarter. Derrick Rose was the only New York Knicks player scoring in double-digit in the first half with 12 points. New York shot 50 percent from the field on 18 of 36 shooting, while Boston went 22 of 49 for 44.9 percent in two quarters. The Celtics led Knicks 56-48 at halftime.